A beautiful little bite of tender, rare roast beef spiked with horseradish in a baby Yorkshire pudding – glorious. To make the Yorkshire puddings, gently add the egg to the flour. Slowly add the water and milk to the mix, stirring continuously to keep it smooth. Put a few drops of oil into each small muffin tray and put into a medium hot oven to heat. When the tray is hot, pour 2.5cm/1in of mixture into each space and replace in the oven. Cook for about 8-10 minutes until the mixture has puffed up. Then cool on a cooling rack. To make the horseradish cream, simply mix all the ingredients together. 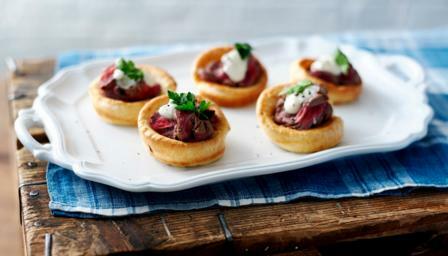 Cook fillet of beef rare (or more done if you prefer), slice thinly and arrange on the baby Yorkshire puddings. Add a dollop of horseradish cream and decorate with a sprig of flat leaf parsley.